It’s time to let go of the old and worn out so that the new can come in. Our angel works her way out of the sea. Leaving the tumultuous swirling water behind her; even glancing over her shoulder to mark both her progress and to reflect on the situation she’s leaving behind. At her feet, the waters swirl as if reaching out in a last attempt to pull her back. Instead, it becomes part of the fabric of her gown that she’ll take with her to shore. Her memories of where she has been. There are no nuances in this message. Move on. Get up; get going. Walk away. You may be tired and exhausted, even. You may look at the image of our angel and think to yourself, “Sure. Go head. You’ll only get stuck in the wet sand when you finally do reach the shore.” Doesn’t it just make more sense to stay in the water and forego the hot pretzel stand? Let’s think about it. Let’s take a look at a few reasons we give ourselves for staying put; and a few reasons to run for the shore. You would love to leave and never go back but … ugh. You would have to get your resume together. Start searching the want-ads. Maybe sign up with an agency. Then the ever-dreaded interviews. Hopefully. It is difficult to believe, with all of this to consider, that it’s the Staying that is most likely exhausting you. When we look at how far we would need to go; the work that we would have to most likely do to get there we should consider it not so much an indicator to stay put but rather a warning flag as to how far off our path we’ve strayed. Begin your journey with this prayer and let your heart guide your words as you go! Moving on from negative relationships: He may change tomorrow. It is true. He may well change tomorrow and become the attentive partner that you not only want but deserve. She may change tomorrow and understand the importance of fidelity and commitment. There are a few things that we want to remember when it comes to deciding whether to stay or move on. First, no decision is a decision to stay and keep things as they are. So even if you feel you aren’t ready to make one – you’re making one. Second, you don’t have to run away – you can walk away. You can look over your shoulder; you can listen to what is happening behind you. If you sense a change, pause and see if that’s true or wishful thinking. Stand still and listen with your heart. Archangel Raphael is the angel of happy meetings. He brings us together with those we are meant to be with and encourages us to look at ending current relationships not so much as failure but as a step on your journey to meeting that special someone. Archangel Raphael carries with him an emerald green light of healing. As you transition out of your relationship, imagine yourself surrounded by Raphael’s green light. See it as protection but also see it as a source of wisdom. On those particularly rough patch days, wear a green scarf, carry a green leaf tucked into your pocket. You are never alone with the angels and Raphael’s presence is one that you will feel surrounding you just for the asking. Moving on from ….You. Two years ago, I had the opportunity to move to a new city. It would be our fourth state in ten years. With the move, came the unenviable bedroom closet clearing as the house went on the market. Determined that we were going to get rid of everything we didn’t wear, the purging began. When we finished, my husband had six bags full of pants and shirts and suits that no longer fit. I had an ugly Christmas sweater. “You’re getting rid of THAT?,” he commented. Good point, I thought, and grabbed it back. Perhaps I misunderstood. I padded back and forth to the closet, lovingly replacing all of the evening dresses and high heeled shoes and suits and … that I hadn’t worn in years. My once lifestyle was … well, Once. There are times when moving on entails moving on from who we were and who we no longer are. Perhaps the most painful move of all. That label or persona that we wore no longer serves its purpose. Just as mammals shed, at times so must we. Just like the mammals we are, we must look at our “shedding” as the time when we get rid of the old; that which no longer serves a purpose. The coat that no longer fits. 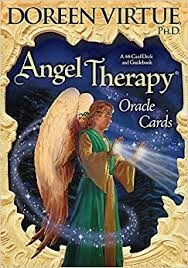 Just as Archangel Raphael helps as we leave unhealthy relationships with others, he helps as we struggle to attain a healthy relationship with ourselves. “Raphael, please find me where I need to be.” A lovely, ever-brief prayer – perhaps more a proclamation – that you can use 100 times a day or more to bring comfort and to help you to remember that Raphael is with you, guiding you to your best self. Contrary to what we often hear and what you may believe, the first step isn’t the most difficult step. There’s momentum there. That first step is driven by the desire for action; determination to change. It’s the second, third … tenth steps that can prove to be the most difficult. It is during those times when you feel very far away from where you were and where you’re going seems to be but a dream in the distance. Dearest Uriel, please place your hand on my shoulder. Keep me firm in my goal; moving step by step without fear. Light my way, dear Uriel, so that my steps may be steady and balanced; and so that my heart may see the progress I have made. When the Time to Move On card presents itself in our reading, it tells us just that. Nothing fussy or vague. Nothing much to interpret. Move on. Move on with gratitude. Gratitude that you have the stamina and discernment to make that first step. Move on with confidence that the angels are with you at every step and that you are not alone and you will not fail. Move on, perhaps most importantly, with forgiveness for yourself and others for the situation that you have found yourself in. Move on with courage, knowing Michael the Archangel walks before you, sword in hand, to clear your path. As we approach and celebrate the New Year, let’s spend some time reflecting on who we are and who, and where, we want to be. Happy New Year! Contact Julianna Day now and start your angel card reading with 3 free minutes! 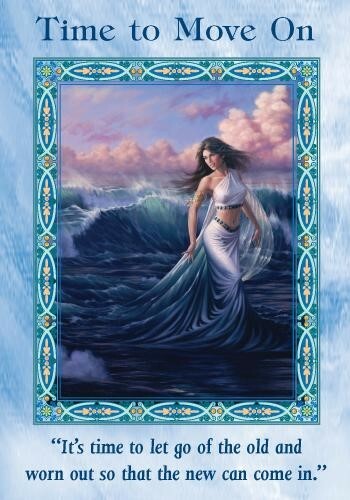 The Time to Move On Angel Card is selected from Doreen Virtue’s Angel Therapy deck.